This has probably been discussed before but I've noticed a small difference between "Babylon Squared" and "WWE".When Delenn told Sinclair "We have to go" in "Babylon Squared" it was visible that she was wearing a red cloth.In "WWE" she was dressed in brown.I wonder how could JMS miss that small but important detail. He didn't miss it, there jsut wasn't a way to work it in without taking up episode time. There's another difference in the explanation of how Zathras got there. Thanks Jan.I hadn't niticed the part about Zathras before. I'm surprised that they just didn't dress Delenn in red from the beginning of "WWE".It would be much easier than finding a way to do it in the middle of the story.What were they thinking-that she had a secret wardrobe hidden somewhere in B4 . This episode blew me away the first time I saw it, and the effect is still the same upon rewatching now. I watched it twice, back to back, and couldn't just move on to the next episode afterwards. There's so much emotional intensity from all of the characters. In the flash forward Londo says that letting John and Delenn go is his last chance for redemption. That would be in accordance with Lady Morella's prophecy - though not killing the one who is already dead would also seem to apply. After all, Sheridan died on Z'ha'dum prior to that. Sinclair reaching out to touch his past self also reminded me of Michelangelo's painting! The fact that The One consists of three is more than just a coincidental reference to the Biblical Trinity, imo - God is three in one. As for the time travel - oh, what a tangled web! But it's done as excellently as such a premise can be done, with very tantalizing peeks into the future - and the past. The more I see of Zathras, the more I wonder about who he really is and how deep his knowledge and abilities really go. What he does here is no mean task! In "B squared" and the first part, it's easy to see him as a bumbling comic relief character. But he too has his destiny - I wonder what his role is in Minbari's past?! Nonetheless, I love his humorous monologues. The most gripping moments are those between Sheridan and Delenn in future captivity. JMS said he was going to do their first kiss differently, and he sure did! Seeing how deeply they love each other is heartwarming - and heartbreaking. And Sinclair as Valen has to be the greatest comeback of a character in a science fiction series! What a turn of events, making him a mythological hero. "That door is closed forever" - I'm glad JMS chose to put an end to any speculations about future use of the time rift in Sector 14. Anything that comes after this would be anticlimactic. Last edited by Estelyn; September 18th 10 at 20:48. It's the most amazing episode in the series. And it felt like the "end" of the series, in a way. Don't get me wrong, there was plenty of story to go, I know that. But somehow, this always feels like the end of the story, to me. It's always such a shame to see a work of JMS the he couldn't complete. He is at his best when he can complete his thoughts. 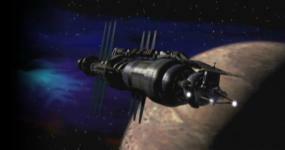 Several years ago, when the British Sci-Fi channel showed the whole series, they had a whole load of `awards` to (notionally) give out for various features, from `best spaceship` (Shadow battlecrab, I believe - a long time ago, now) to `best recurring character` (either Bester or Zathras - my vote went to Zathras as, much as I admired Walter Koenig's acting, I'd never vote for `creepy`) to `best plot twist` (and many others that I'm afraid I've forgotten, though I'm almost certain Marcus won something). The top answer (I've also forgotten numbers 2 - 5, alas ) for `best plot twist` was indeed the transformation of Sinclair into Valen. I don't think the fantastic `idea` really impacted on me (the first time), despite Marcus' sudden moment of understanding, until Zathras actually showed the 2 Minbari warriors (and therefore us) what had happened. I, too, was `blown away` . Joe got all five years, so don't know what you're getting at. Crusade and Jerimiah. Both were series that I enjoyed and hated to see dropped so soon. We see Delenn tell Sheridan, in the "time flash", not to go to Z'ha'dum--knowing what would happen, I can sort of see why from a personal standpoint (he'd be limited to 20 more years of life, and at the time of that scene the end of that was coming close)--but what would have happened had he not gone? The conditions by which Sheridan could bring together the younger races, and convince the First Ones to leave the galaxy, would not have been there. The "unexpected door" he opened, bringing the Vorlon-Shadow conflict to a real, direct head rather than it remaining just one more proxy war like the ones before it, had initially devastating consequences (planet destroyers deployed and such)--but it was probably the only way the younger races could see them for what they had become, and reject their influence. In the end it might have saved more lives than would have been lost in another round (and who knows how many more rounds) of First One-inspired galactic wars as had been the pattern of history--and fulfilled a task that would inevitably have to be fulfilled at some time or other (younger races "growing up"). Delenn of course would have understood all this from retrospect, yet still made an attempt to change the past. A very "human" moment to be sure. The Minbari side of Delenn would have understood the necessity of her and Sheridan's sacrifice for the "big picture"--interesting that that didn't prevail, in that one moment when she tried to alter the past by telling Sheridan not to go to Z'ha'dum. No doubt Sinclair/Valen faced similar temptations to try to alter the timeline with his influence. Last edited by Alioth; May 12th 12 at 10:42.